Your skin is the biggest organ in your body. 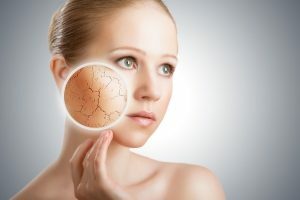 If our bodies organs shut down with a lack of water, imagine the damage you are doing to your skin through dehydration. Dehydration in the skin weakens its defense and creates skin sensitivity, irritation, and premature aging. The outer layer of your skin; known as the Stratum Corneum is made up of what is called your Natural Moisturizing Factor. Water naturally binds to this NMF and it is this water binding that is what creates skin hydration. Balanced skin depends on the production and health of these natural moisturizing factors so that your skin can both attract and retain water. Healthy skin contains between 10-20% water. When your skin is less than 10% water it is considered to be dehydrated. Drinking 6-8 glasses of water a day is vital in hydrating the inside of your body. Normally your skin will maintain its own water level however when outside elements are present then water loss increases in your Natural Moisturizing Factor, your skin. Extreme temperatures, air-conditioning, heaters, soap, medications, sun, alcohol, and smoking all affect this protective barrier of your skin (NMF). When your skin becomes dehydrated you experience symptoms of dryness, flakiness, roughness, irritation, and cracking; hence the look of prematurely aged skin. These symptoms can be eliminated by replenishing the Natural Moisturizing Factor and normalizing the Stratum Corneum. Dehydrated skin is less effective as a protective barrier and therefore your skin tends to react easily to active ingredients or outside elements. This is known as sensitive skin. By adding water back into the skin or bringing balance back to the Stratum Corneum, your skin becomes stronger, healthier and less reactive. Through sun exposure, Ultra Violet Rays breakdown fibers in our skin know as elastin. The sun also absorbs water from you skin. This wear on elastin fibers results in the inability for the skin to snap back into shape, resulting in wrinkles. Further water loss in the top layer of our skin through external aggressions leads to lines and wrinkles looking deeper and more pronounced. In addition to these pronounced lines and wrinkles, when your skin is lacking in water additional lines are developed adding to the look of prematurely aged skin. To avoid dehydration in you skin, a proper cleansing, exfoliating and protecting program should be implemented. A proper skin program will both supply hydrolphic substances to the Stratum Corneum that will attract and retain moisture. These substances will also restore and maintain the barrier of your skin to prevent further water loss. When looking for ingredients in products, you should look for humectants that will hydrate the Stratum Corneum. Propylene Glycol and Sodium PCA are examples of humectants that bind water to the skin. Urea also helps reduce epidermal water loss and helps the skin to be less susceptible against skin irritation. Other beneficial ingredients include lactic acid; a natural fruit acid that improves skin hydration, vitamin D; moisturizes and conditions, vitamin C (l-ascorbic acid, magnesium ascorbyl, ascorbyl palmitate); protects against UVA and UVB rays, Vitamin E (tocopheryl, tocopheryl acetate, alpha tocopheryl); conditions, moisturizes and protects moisture retention, Flax Seed Oil, Evening Primrose Oil, Safflower Oil, Borage Oil, Linolenic acid; maintains the barrier function and moisturizes. Internally, you should eat organic foods such as wheat germ, nuts, green leafy vegetable, whole grains (Vitamin E), egg yolks, salmon, fortified milk (Vitamin D), Broccoli, cabbage, tomatoes, citrus fruits (Vitamin C). By supplying your skin with internal nourishment and proper external care, you will maintain balance of your Stratum Corneum leading to healthy, strong and more youthful looking skin. Why not work to prevent rather than work to treat? Allison Hegedus is the President of Vida Spas with over twenty six years experience in the industry.